Sri Lankan universities have decided to take stern action against Ragging and violence after a freshman female student of Kelaniya University was ragged by a group of senior students. Vice Chancellor of the Kelaniya University, Professor Sunanda Madduma Bandara said all the universities in the country will fully implement the Charter signed by the Commonwealth University Union and the University Grants Commission to eliminate ragging and violence against women from the 12th of this month. Ten undergraduates of Kelaniya University allegedly involved in ragging a female fresher are to be charged under the Anti Ragging Act for which tough penalties could be imposed, police said. Officer-in-Charge of Kiribathgoda Police, Chief Inspector (CI) S.K. Meeallage said police had acted after the student complained to them of being assaulted and verbally abused for wearing Denim jeans to university. CI Meeallage told that according to the complaint, the fresher had been told to remove her Denim jeans in public. Thereafter, abusive language was used on her and one of them had slapped her hard, causing her to strike her head against a wall. “Seven suspects were arrested with the assistance of other police stations in various parts of the country where they were residing. They were remanded till May 17 after being produced in the Mahara Magistrate courts,” he said. He said that, among those arrested are two first-year undergraduates who allegedly told the victim to withdraw her compliant. However, the possibility that these two undergraduates were forced to threaten the victim has not been ruled out. “Police and the university will provide special security for the fresher who complained. We intend to offer her a safe house and security outdoors. The university will be requested to provide her security within the campus,” he said. A search for three other suspects is in progress. They are from Negombo, Gokerella and Ibbagamuwa. Under the Anti Ragging Act, sexual harassment or causing grievous hurt to a student or member of the staff in Educational Institutions is a non-bailable offence, for which bail should be obtained from a High Court. If found guilty, they are liable to imprisonment for a term not exceeding 10 years, and could also be ordered to pay compensation of an amount determined by court. 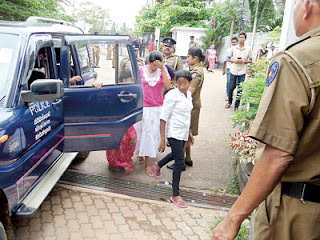 Kelaniya University Vice Chancellor (VC) Prof Sunanda Maddumabandara said that, this time they allowed the girl to file a police complaint before an internal investigation. “We are taking disciplinary action against the suspected students while ensuring the safety of the victimised girl”, he said. “Ragging is a menace that affects university activities. To date, eight students have left our university this year for ragging. There could be more planning to leave or have already left without giving notice,” he said. He said that most students are experiencing stress and are mentally depressed, while some commit harm to themselves due to this. Prof Maddumabandara said, “Therefore, the university administration is compelled to take maximum action under the Act Prohibiting Ragging in Educational Institutions. Kelaniya University Teachers Association Chairman Prof Sumathipala Halpita said the student victim took the right action. He said the University academic staff too stood with her against ragging within the university. Prof Halpita condemned the actions of the group of students who verbally and physically attack university students. The University Grants Commission recently decided to initiate tough action to prevent ragging. Among the measures were to implement the anti-ragging act with tough penalties including expulsion. The Anti-Ragging Act introduced in 1998 has so far not been strictly enforced. Meanwhile Sri Lanka's Marxist party, Janatha Vimukthi Peramuna affiliated student union IUSF “Anthare” says ragging has become a subculture and it is not only in universities it exists. This subculture of ragging also exists in offices, schools, army camps, police stations and other institutions, the convener of the Inter University Student Federation (IUSF) Lahiru Weerasekara told. The student union leader charged that there is a movement to suppress the students behind the arrest of students alleged of ragging. University ragging must be stopped altogether. My son had to undergo severe physical ragging at Akbar hall in Peradeniya campus. He is a tough guy who doesn't bother to remove his clothes in front of seniors and perform tough physical exercises that seniors ordered. But even he could not bear the physical and mental strain that seniors forced on him for long. He fled away from the hall of residence after going through inhuman and barbaric ragging. After coming home he told that he would not go back to the university again. When we requested him to change his mind he told that he would rather commit suicide. He was totally changed due to ragging. A very tough guy became a timid fellow who always tries to hide in his room. He doesn't want to face others and tries to be lonely. Feel scared even to apply for the university. Don't miss your chance because about 25000 out of 300000 get university admission. If you are shrewd enough you will be able to escape torture. I'm also a Peradeniya graduate but was lucky enough to avoid inhuman ragging. Oh thank you for the details. I've heard that ragging for girls is really really inhuman. By the way I can't imagine what do they expect by torturing someone. Since I'm a Peradeniya graduate who underwent ragging for several months I know most of the methods of ragging but if I reveal them the university students will use them on their juniors(freshers). What about the Science faculty? It's said that Art faculty has much ragging. Arts students are called "kunu arto"(dirty arto) by all others and when they are ragging other students they frequently remind this word and intensify ragging. When you are in university halls(residence) you have no any chance to avoid the course of ragging. If you are from a well to do family you will be the worst affected and if you are easily notable due to physical difference such as skin color, height and size you will suffer more. Oh is that so? However thank you so much for the details. I never knew them before. Do the seniors expect juniors to be under their control? When you enter the campus very first day you realize where your position in the campus is. You get through very competitive GCE A/L exam with greatest difficulty and go to the campus with some pride in your mind. But once you meet your seniors you are just a kunu(dirty) fresha and they know how to let you down mentally to the lowest level. I felt I was in front of a firing squad very first day. I don't know how these seniors who are just 1 or 2 years senior became so powerful as to make us untouchable beggars. Once again thanks for the details I got a very good understanding about university atmosphere. That'll be very helpful for me. What about the area and the school from which the fresher has come? Do they affect at ragging? Your question is bizarre and may visit ugc website to find out details regarding the freshers.